Continuing my movie-themed posts of late I thought I would finally put down a list I've been mulling for some time now. Most people consider such film directors as Alfred Hitchcock, Orson Wells and Stanley Kubrick to be amongst the best of all time. Since I was born in 1975 I don't have much perspective on the late great directors of the past (although I love several of Hitchcock's films). I'm basing my list of the 11 greatest directors working in Hollywood today on my personal movie-watching experience. I'm skewing the list based on movies I've seen that were released in my lifetime (most of which fall within the last 25 years). I consider the following 11 filmmakers to be the most talented men (sorry, no women made the list) behind the camera. If I was producing a film (as-if) I would start my search for a director based on the following auteurs. I had to add an 11th slot in this list to give props to this young director. It may be audacious to put someone who has one film under his belt on this list, but District 9 is a game changer and if I could buy stock in Blomkamp right now I would. At 30 years old he has a bright future ahead of him in Hollywood. I recently saw some of the behind-the-scenes footage on the D9 Bluray and Blomkamp seems to understand what it takes to be a successful big-time director in this business. #10 - M. Night Shyamalan (The Sixth Sense, Unbreakable, Signs) - Night used to be in Blomkamp's position 10 years ago. He had burst onto the scene with The Sixth Sense and I became a huge fan after thoroughly enjoying Unbreakable on the big screen. After Signs, Shyamalan cemented himself in the top spot for me in terms of my favorite directors in Hollywood. Many people hated The Village, but once again I was very impressed by the cinematography and story that Night put forth. Then came back-to-back disasters in Lady in the Water and The Happening. Two terrible films (The Happening may be the worst movie of the last decade) that completely made me lose respect for Shyamalan. I don't know what happened here. Night is still only 39 and has time to right the ship (starting with The Last Airbender in 2010). I'm hoping that somehow he can return to the Night of the early 2000's. #9 - Christopher Nolan (The Dark Knight, Memento, Insomnia) - Another 39-year-old, Nolan has only directed five major films thus-far. It just so happens that one of them is The Dark Knight, probably the best comic book movie ever made. Before directing Heath Ledger's amazing performance, Nolan had already gained my respect with the brilliant Memento as well as solid films in Batman Begins and Insomnia. I still need to see his fifth film, The Prestige, and I am already looking forward to his Leo DiCaprio 2010 thriller titled Inception. Nolan does a great job of choosing his films wisely and taking time to ensure he shoots quality finished products. #8 - Paul Thomas Anderson (There Will Be Blood, Magnolia, Boogie Nights) - Anderson (PTA) is yet ANOTHER 39-year-old (1970 is shaping up to be the year of the director) who like Nolan picks and chooses his films carefully. He only directed two major motion pictures in the 2000's with Punch Drunk Love (a very underrated Adam Sandler movie) and There Will Be Blood. I thought TWBB deserved Best Picture in 2007 but I was already a huge fan of PTA before then. His breakthrough hit Boogie Nights was excellent and put him on the map in 1997. He followed that up with my second favorite Anderson film in Magnolia. If you haven't seen Magnolia, give it a rent today. Tom Cruise is awesome in that movie and PTA does a great job of weaving together a variety of great performances from an all-star cast. #7 - Clint Eastwood (Million Dollar Baby, Gran Torino, Unforgiven) - We all knew Clint could act from his Dirty Harry / Western days but I don't think many film aficionados knew Eastwood would turn into such a good director. He broke through as a filmmaker in 1992 with a Best Picture and Best Director award for Unforgiven. After that he churned out a string of mediocre movies but returned to win double Oscar gold again in 2004 with Million Dollar Baby. The performance he got out of Hillary Swank in that film was extraordinary. 2008's Gran Torino shows that Eastwood still has what it takes as he continues to make great movies at age 80. Most people settle for a lifetime achievement award at this age but it looks like Clint wants to go to his grave making motion pictures. #6 - James Cameron (Aliens, Titanic, Avatar) - If you want to make a throw a gigantic budget at a movie, you best get on the phone and get Jim Cameron to direct it. Cameron's track record at producing epic films with multi millions of dollars is unprecedented. He may soon hold the #1 and #2 spots all-time in worldwide box office grosses with Titanic and Avatar. Both films actually live up to the hype (Titanic more so than Avatar) they were faced with during production. Cameron makes this spot on the list for me as he also directed Aliens (my 2nd favorite movie of all-time). Don't forget about Terminator, Terminator 2, The Abyss and True Lies. Quite a resume. Cameron is a film legend and will get his lifetime achievement award sometime in the next few decades. #5 - Peter Jackson (The Lord of the Rings Trilogy, King Kong, The Lovely Bones) - OK, let's forget that King Kong kinda sucked, that I haven't seen Lovely Bones and that he hasn't really directed many other quality films. Peter Jackson's Lord of the Rings trilogy is the greatest cinematic achievement in history. For that alone he makes the top five of this list. To come out of nowhere and write, produce and direct three back-to-back-to-back JRR Tolkien movies and to have them released and adored by both fans and critics alike is tremendous. Those three films look and sound so good that I don't really see anyone putting together a trilogy that can match the quality that Jackson and his WETA staff produced. He also gets a boost over Cameron for producing and financing District 9. Hopefully Guillermo Del Toro (would be #12 on this list) can collaborate well with Jackson in directing the upcoming Hobbit movies. #4 - David Fincher (The Curious Case of Benjamin Button, Seven, Fight Club) - I thought Fight Club was pretty good but not the amazing cult classic people make it out to be. Fight Club is not why Fincher makes the upper half of this list. His track record for making unique and interesting films sets him apart from his contemporaries. His first major film was Alien 3, a film I hated so much when I saw it in theaters (as it followed my favorite movie at the time in Aliens). It seemed so amateur and rushed that I wrote off Fincher as a flash in the pan. He more than redeemed himself with Se7en (the dark Brad Pitt / Morgan Freeman / Kevin Spacey thriller) in 1995 and The Game in 1997. The Game (Michael Douglas and Sean Penn) would make my list of the most underrated films of all-time (oh boy another list blog post idea). Jodie Foster's Panic Room was a well-done thriller in 2002 but Fincher's masterpiece turned out to be Benjamin Button in 2008. He worked the plot of that movie so well in building emotion throughout the film. One word you can never use to describe a David Fincher film is "boring." #3 - Quentin Tarantino - (Pulp Fiction, Kill Bill, Inglourious Basterds) - You can't really call Tarantino a young director anymore as he's in the upper-end of his forties. You could still call QT a cinematic genius though as a result of his excellent resume of films. Tarantino really might be the best screenwriter in motion picture history. His dialogue in his films is so unique and real that the visuals and effects become secondary. The over-the-top violence and eclectic soundtracks add to his unique style of filmmaking. Pulp Fiction is his masterpiece, but Kill Bill (1 and 2), Reservoir Dogs and the recent Inglourious Basterds are all amazing movies in their own right. For nearly 20 years, Tarantino has been a staple of offbeat and effective filmmaking in Hollywood. #2 - Martin Scorsese - (Goodfellas, The Departed, Gangs of New York) - I really do need to go back and watch Raging Bull and Taxi Driver again but if you judge Scorsese on his body of work after the 1980's you still have an amazing resume on your hands. Goodfellas is one of the best movies ever made and should have won Best Picture over Dances With Wolves in 1991. Scorsese earned several Oscar nods since then with Casino, Gangs of NY and The Aviator but finally broke through in 2006 with The Departed. The Departed is right up there with Goodfellas as my favorite Scorsese film. Like Eastwood, Martin Scorsese seems to be improving with age. I only wish he would try to work without Leo DiCaprio for a few films. With Shutter Island coming in early 2010, Scorsese will have worked with DiCaprio in four straight movies. While the pairing of the two talents is a good one, I think Martin could use a little more variety to stretch his skills a bit. #1 - Steven Spielberg - (Saving Private Ryan, Jurassic Park, E.T.) - This is a no-contest. Without a doubt Spielberg is the best director working in Hollywood today. From Jaws in 1975 to Munich in 2005, Spielberg has been the master filmmaker of my generation. We're going to forget all about the Crystal Skull Indiana Jones debacle. I'm convinced that George Lucas had Spielberg doped up on some sort of hallucinogens during the filming of that huge steaming turd of a movie. His old movies (can't believe I'm calling them old now) like Raiders of the Lost Ark, Close Encounters and E.T. still hold up now after repeated viewings. After making amazing technological leaps with Jurassic Park, he made the best WWII movie in cinematic history with Saving Private Ryan. Still going strong at age 63 he produced a string of well-made films in the 2000's with AI (I was one of the few who loved this movie), Minority Report, Catch Me If You Can, The Terminal and War of the Worlds (great classic science fiction). I only hope that he keeps going as long as Clint Eastwood has. Extra bonus points for sticking with John Williams, the best composer in film history. 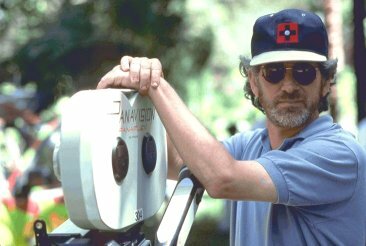 In my mind, Steven Spielberg is the greatest movie director of ALL-TIME and I don't think I will see a more innovative and groundbreaking director in my lifetime. Whew... congratulations if you made it through this list. I assume that you must really enjoy movies as well (probably not as much as I do). As Spielberg and the directors I grew up admiring inch closer to retirement, I'm hopeful that the young blood in Blomkamp, PTA, Nolan along with other recent newcomers like Zach Snyder (300) and Jason Reitman (Up In The Air, Juno) will fill the void. Did I miss anyone on this list? Are there some who don't deserve to be here? Let the debate begin. The Game is an awesome movie! I highly recommend it as well. I am a bit disappointed to see no women on your list but considering they are still by far the minority of directors I am not surprised. Although Sophia Coppola could be on that list a few years from now. I thought about Coppola, but all she's really done is Lost in Translation. Granted that was a great movie, she doesn't have a great overall resume. Now I did put Blomkamp on there with one film, but I have a hunch that he's going to blow up in a few years. Sofia's friend, Wes Anderson, is a much better director. Rushmore, The Royal Tenenbaums, Bottle Rocket, and The Fantastic Mr. Fox (which was excellent).